I have always been a westside girl, from Midtown West all the way down to Chelsea. Perhaps that’s why it took me so long to visit the Cannibal, located in Murray Hill despite an enticing menu featuring an entire section full of tartares and sausages. The Cannibal is located right next door to its sister restaurant Resto, connected by a single door in the back. The restaurant is a tight squeeze with most of the seats around the bar with a few more tables in the back garden. During the middle of a harsh winter we were all huddled indoors, taking the noise level up inside quite a few notches. 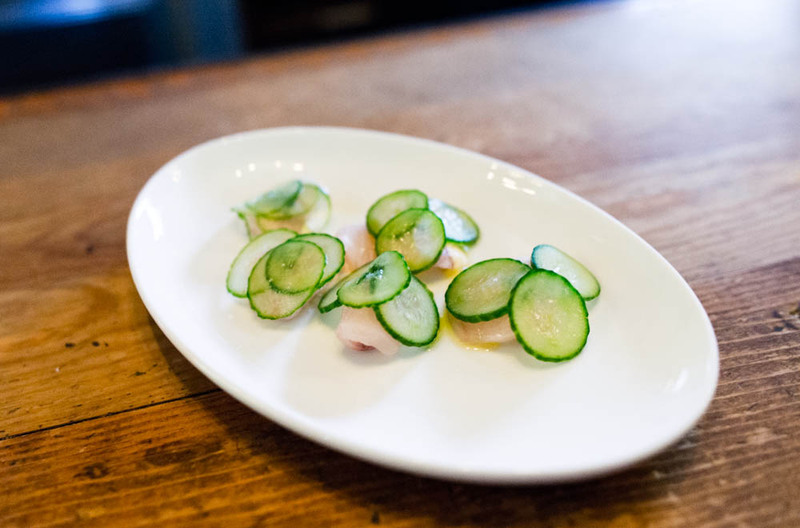 My visit to the original location started off with a light crudo of basil cured hamachi with thinly shaved cucumbers and a creme fraiche. It was a great way to ease into dinner. Continuing with the raw theme, we followed up the hamachi with a plate of lamb tartare. The fine chopped lamb was perfectly tender but with a great bite and the harissa aioli was a classic flavor pairing. 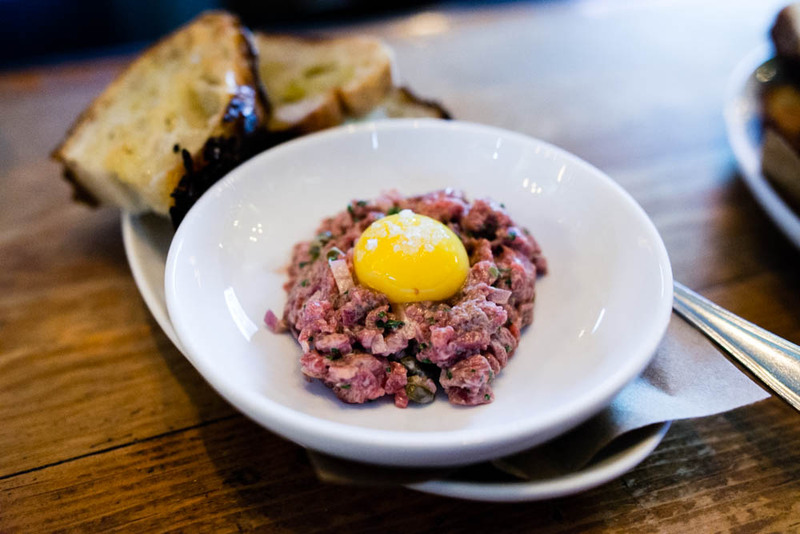 DC was less of a tartare enthusiast so I happily devoured the entire bowl by myself. 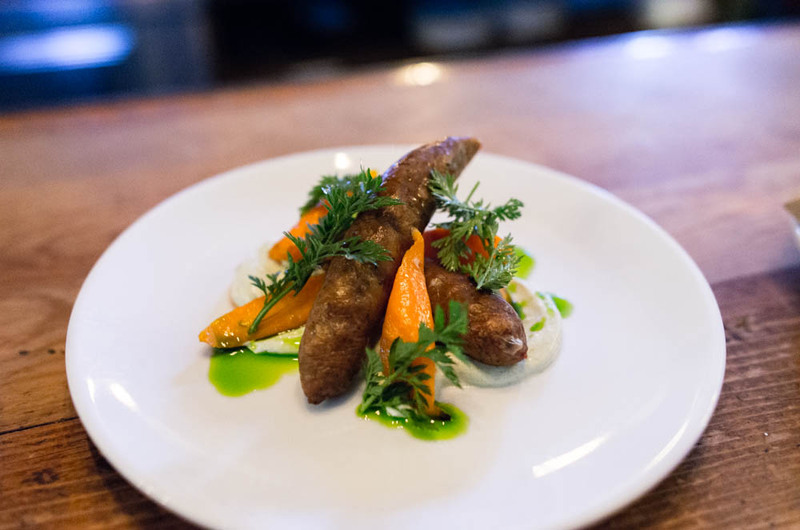 The merguez sausage with mint yogurt and roasted carrots are a great substitute if you are craving the lamb flavor but not ready for raw meat. Word of warning though, this is one spicy sausage that will make you reaching for some ice cold beer. 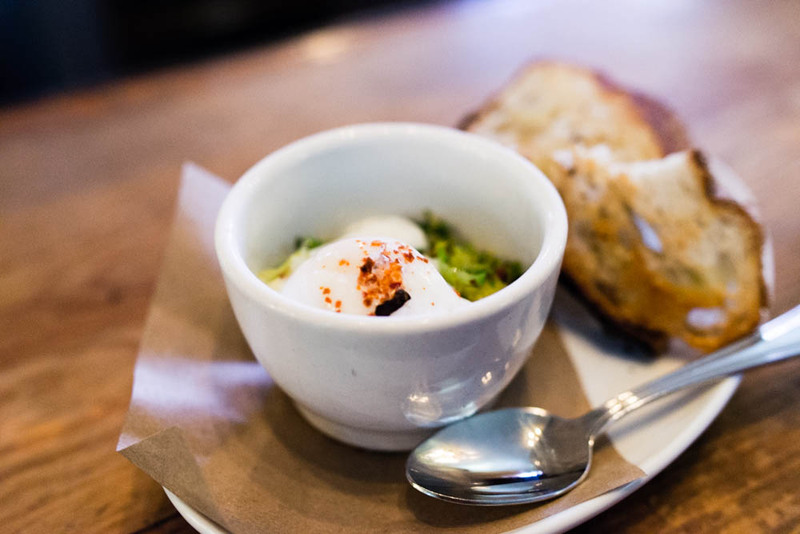 From the small plates section, we chose a lovely poached egg with shaved brussels sprouts and country ham gremolata. The tiny bowl was full of flavor and was delicious nestled on top of a piece of chewy country bread. 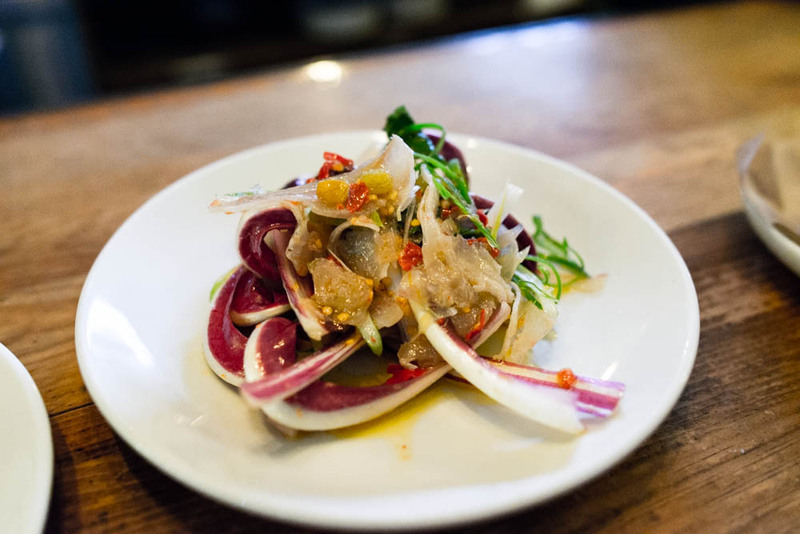 From the vegetable section, the spicy treviso radicchio with beef tendons, calabrian chili, green onion, white raisin in a lemon vinaigrette caught my eye. I loved seeing parts of an animal making an appearance in all sorts of unexpected places. 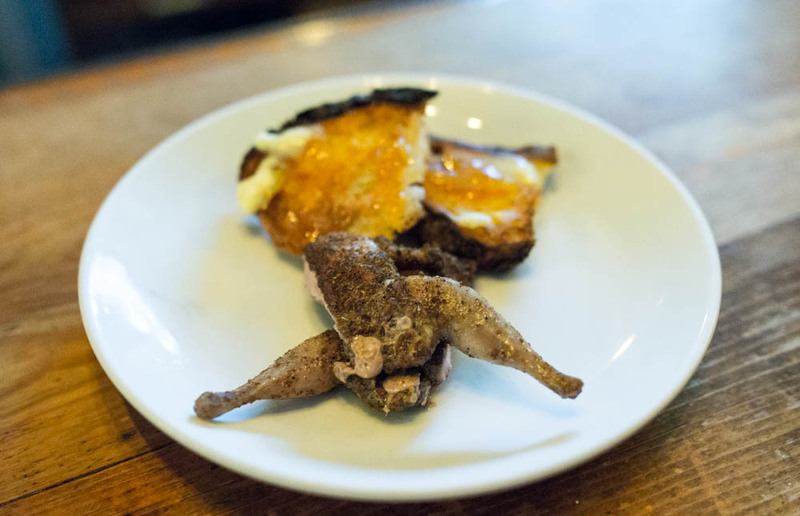 Instead of ending with a heavy meat dish, we went with a lighter fare of grilled quail and marmalade smeared toast. Simply prepared, this dish was flavorful but left me craving for a few more bites. Since we had a relatively light dinner, we had a little bit of room for dessert and boy were we glad we did. 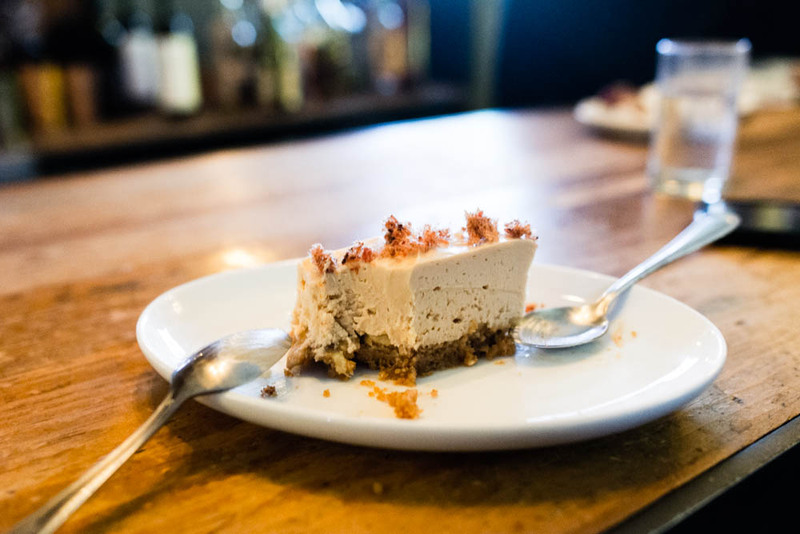 A slice of their housemade peanut butter banana mousse cream pie with a graham cookie crust with crumbled bacon on top was something of that I am sure Elvis would have loved. 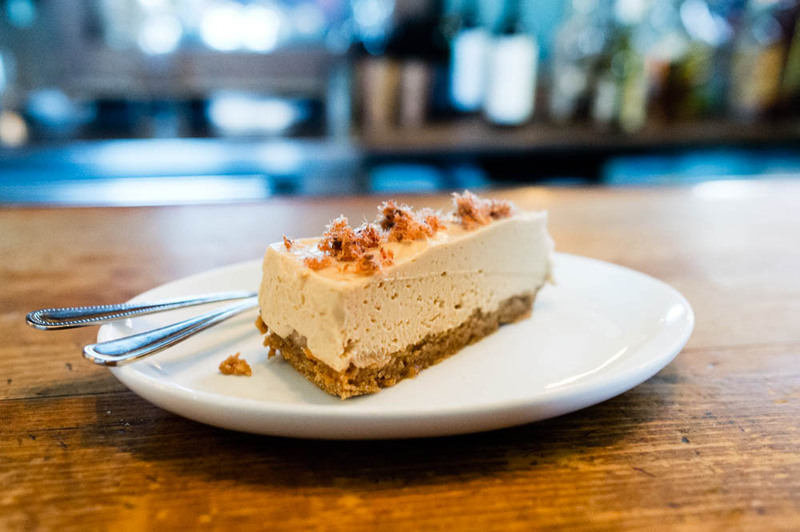 The classic combination of peanut butter and banana was elevated in an airy light mousse and that hint of salty from the bacon was perfect. I was such a convert after just one meal that I immediately followed up my dinner at the Cannibal with a visit to the Cannibal stand at Gotham Market West. A stark contrast to the dark rowdy atmosphere of Cannibal Murray Hill, the location on the west side was airier and brighter. 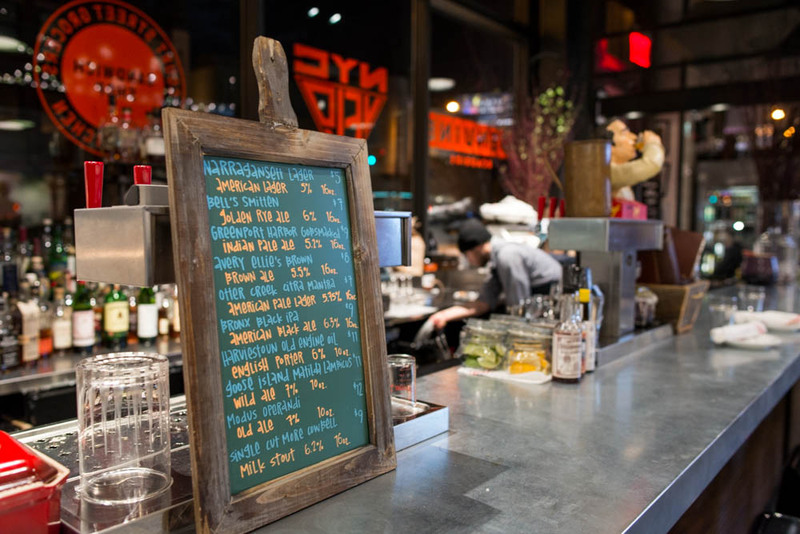 On a random Wednesday night, only a few were perched at the stainless steel bar, catching up with coworkers after work. The menu here shared quite a few similarities with its sibling but they had a few twists and turns of their own. 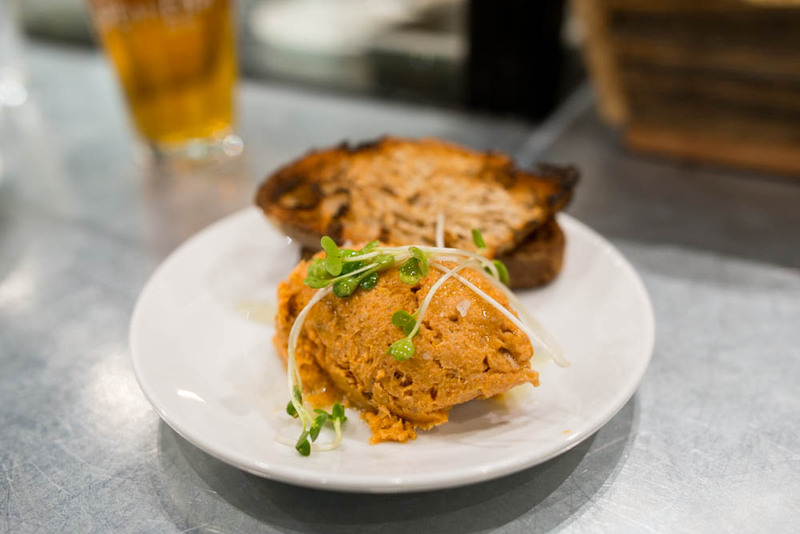 Instead of a crudo, we started with spicy pork kimchi scallion rillette. 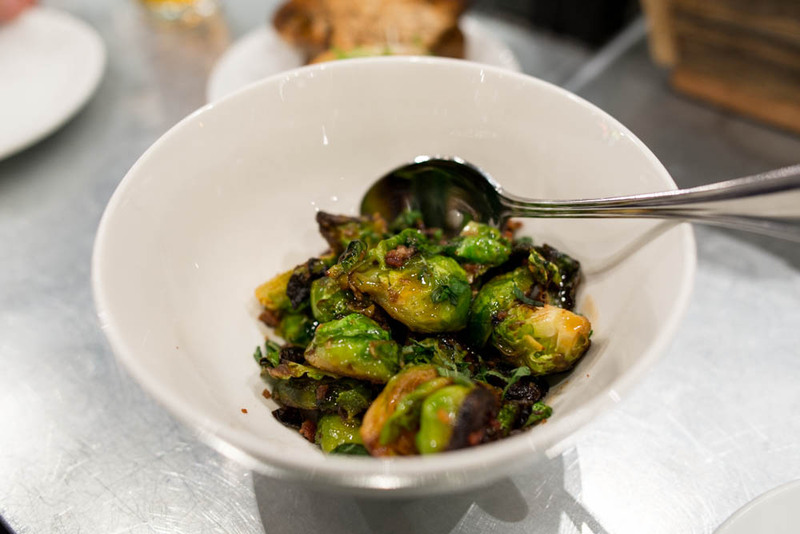 We then supplemented the meaty rillette with a bowl of roasted brussels sprout with a sprinkling of mint and ham gremolata. Everything tastes better with bacon or ham doesn’t it? 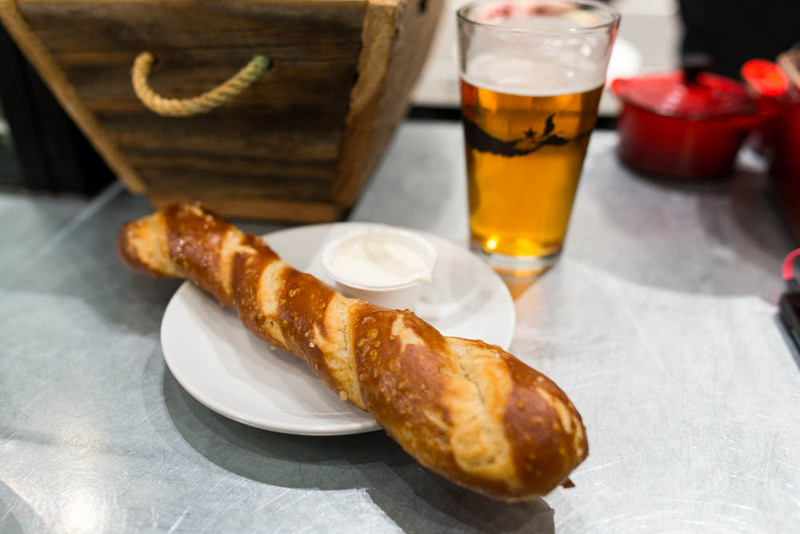 A hot chewy stick of warm pretzel with beer cheddar and a salt roasted Japanese sweet potato followed. 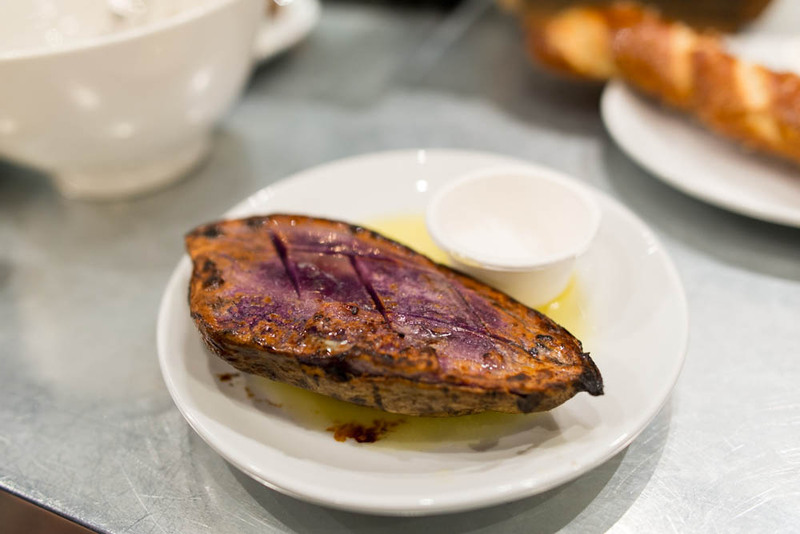 I absolutely loved the simplicity of the sweet potato, dressed with a light touch of melted butter and a sprinkling of coarse sea salt. 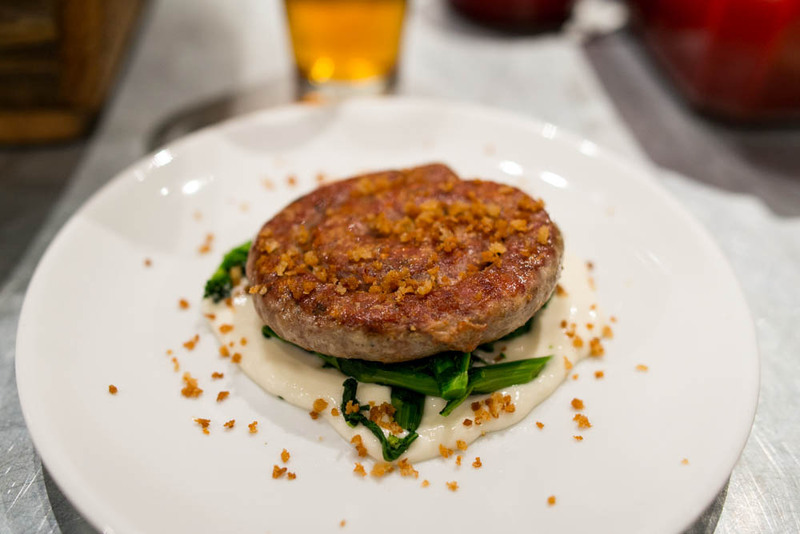 Next up was a wheel of spicy Italian sausage with broccoli rabe and parmesan cream. This time, the heat was much easier to temper with a dab of the parmesan cream. And finally, the piece de resistance of the night, the Cannibal dog 2.0. 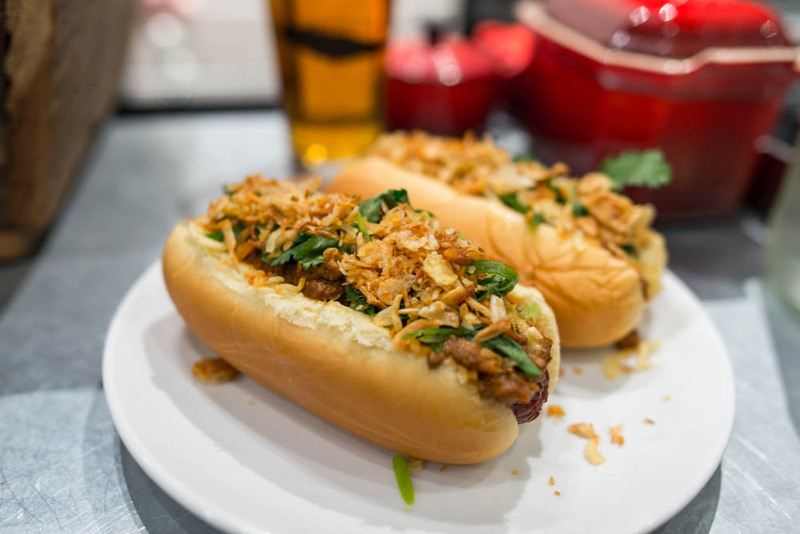 One order comes with two juicy hot dogs on a soft bun loaded with spicy tripe chili and a sprinkling of scallions and fried shallots. Finished off with a zing of Chinese mustard, these were just what I have been craving lately – chili on everything. I really don’t know who would win if the two Cannibal came to a head. My meals at both were so delicious that I would have quite a difficult time being the arbiter. 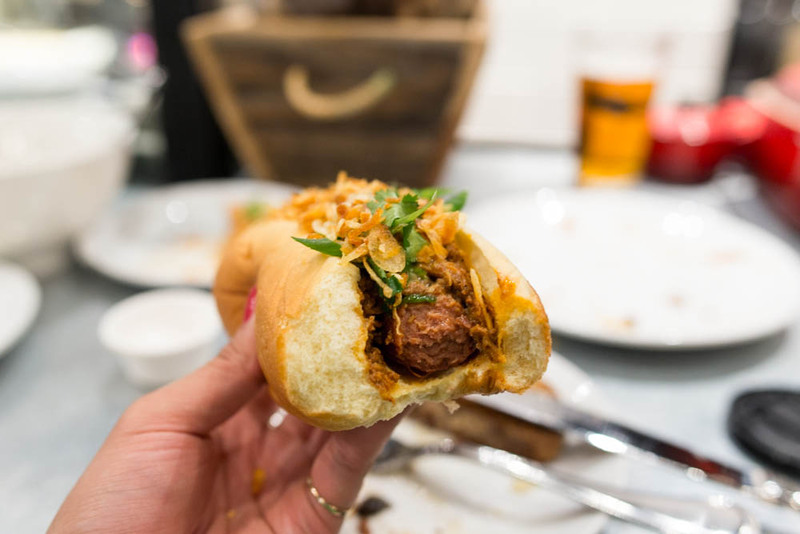 The honest truth is that I am just really happy to have finally tried not only one but both locations of Cannibal and will know where to go for my random tartare and chili dog cravings from now on.